I already bought the bridesmaids dresses last summer so I can't change them. The dresses are royal blue. The problem is I want the wedding to look elegant & romantic with soft pastels since the venue is a historic mansion. I just don't know how to make royal blue work as a color. I'd rather use pastel blue, not such a bold blue. How do I work with this color now that it's too late? Where should I use it in the wedding or do I have to really use it at all? Can I just use pastel blue despite the dresses are royal blue? Since you have already purchased your bridesmaid dresses (and assuming that they cannot be returned for another color), then you need to run with the Royal Blue as one of your colors for the wedding. You can totally introduce an ice blue as an accent color. They look wonderful together and depending on the time of year you are getting married. There are so many ways to use the colors together. If it is a summer wedding you can mix Royal deep blue with and ice blue and lime green accents. 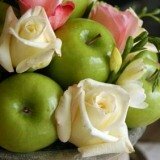 One way to tie the colors together is to use green apples in your floral centerpieces. If it is a fall/winter wedding you could use royal blue with ice blue and deep purple accents. 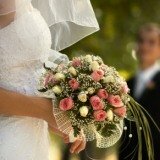 See our theme wedding pages for ways to incorporate any theme into your wedding day. Have some fun and by all means run with it!